The urge to swash and buckle is not lightly ignored. 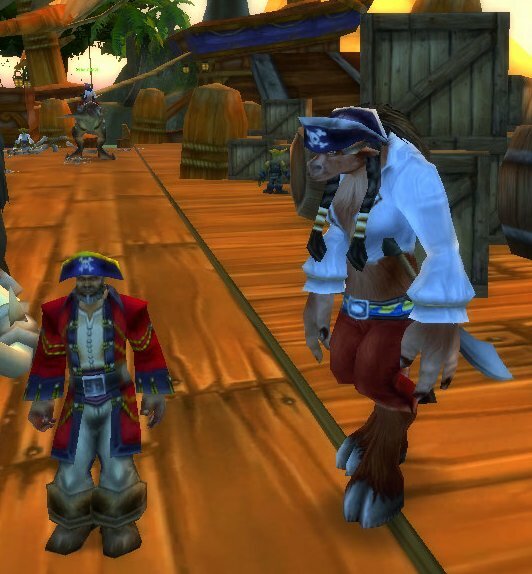 Here are some of my pirate costume ideas. For a quick, easy fix you can always eat Savory Deviate Delight, which, as Kirina already discussed, can be replicated with the Black Swashbuckler’s Shirt, Captain Sanders’ Sash, X-52 Pilots Leggings, and Buccaneer’s Boots. 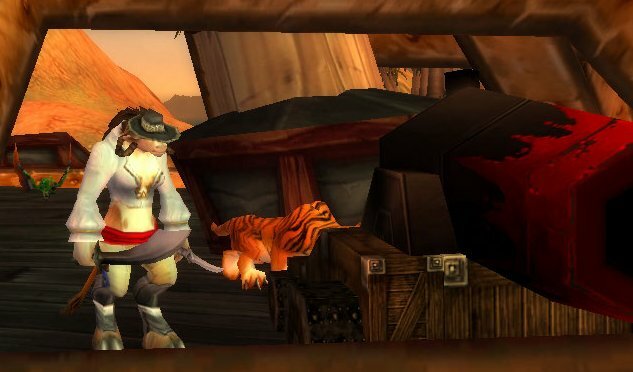 If you want to put in more time and work — and destroy and then have to rebuild your Steamwheedle Cartel reputation — you can go for the Buccaneer’s Uniform. 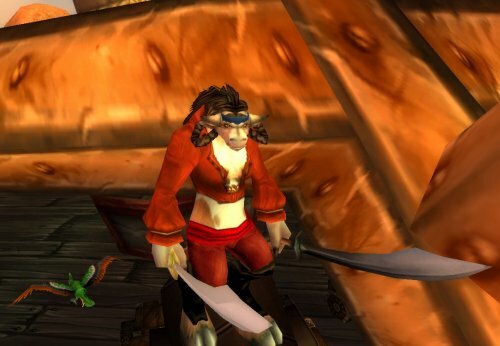 For all the effort it takes to earn the genuine Bloodsail Uniform, it is actually fairly easily replicated with the Buccaneer’s Vest / White Swashbuckler’s Shirt, Captain Sanders’ Sash, Knitted Pants, and Buccaneer’s Boots. 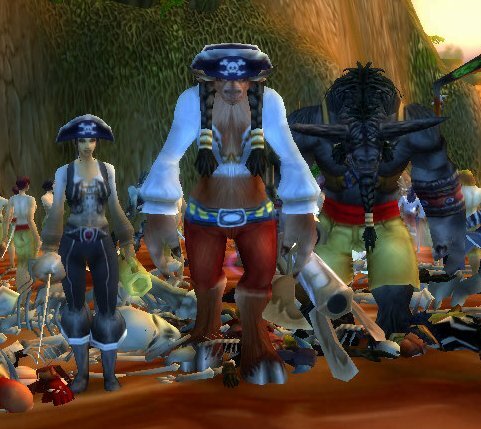 By speaking to Demeza, or to any of the pirate-costumed commoners in capital cities, you receive the Corsair Costume. 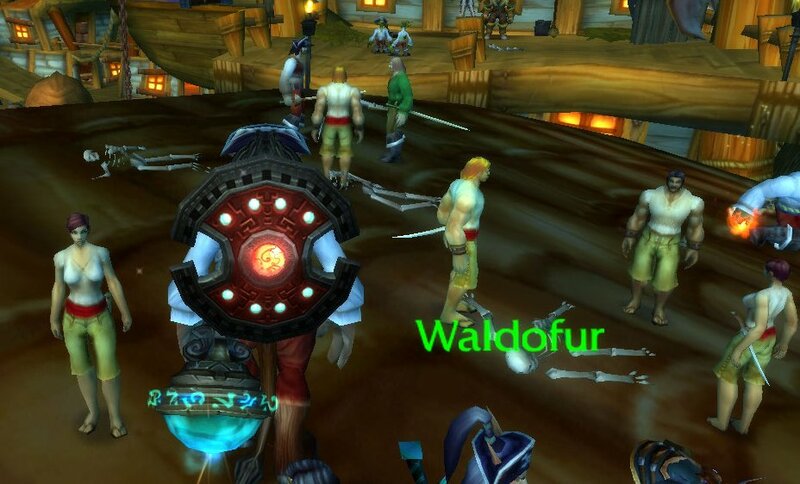 The closest matches I found for Captain Demeza’s clothes are the Shadow Council Tunic and Shadow Council Pants, green drops off mobs in the highest level zones of Outland, along with the Silver-Thread Sash and Buccaneer’s Boots . A rapier and the Disciple’s Stein complete the set. 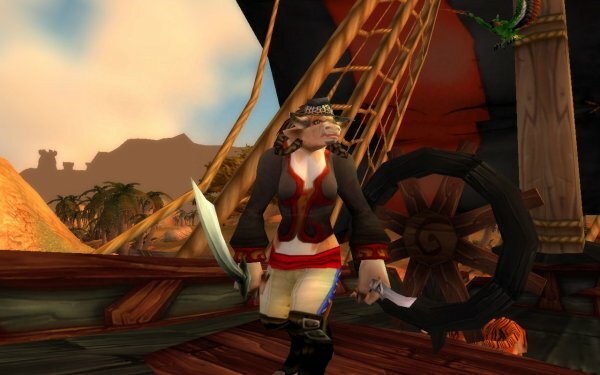 Ketura is too low level to wear even the tailored Admiral’s Hat (which requires level 43), so she’ll be wearing either the Silk Headband or Battered Jungle Hat, which I thought were the most piratey options available for her level. 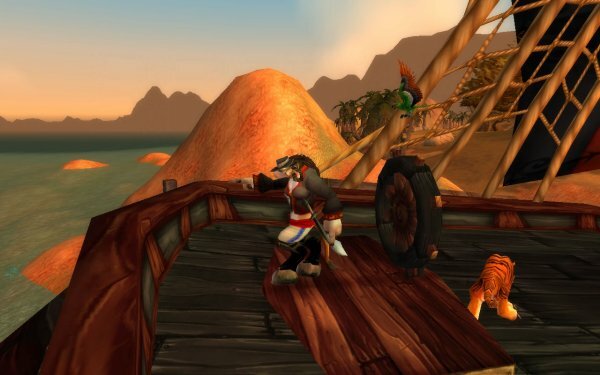 Her companion is the Senegal Parrot, which is a smaller version of First Mate Hapana’s pet. 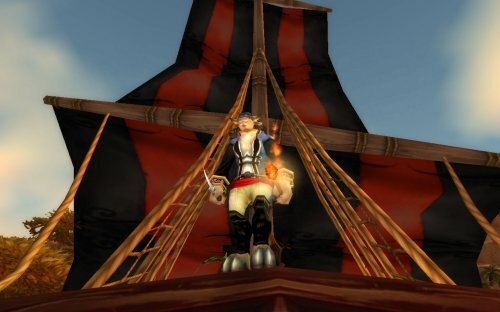 Or you could choose to be part of Demeza’s Dread Crew with an outfit of Deckhand’s Shirt / Captain Sanders’ Shirt, Captain Sanders’ Sash, Seafarer’s Pantaloons, Knitted Sandals, with a Cutlass and Ritual Stein. The men are also wearing Canvas Bracers. 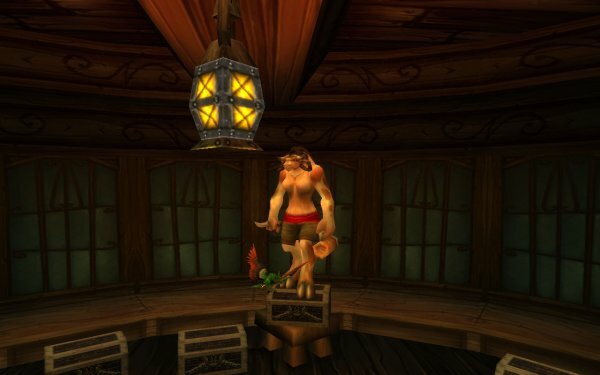 The Seafarer’s Pantaloons drop from a level 22 rare mob in Loch Modan, the Large Loch Crocolisk. 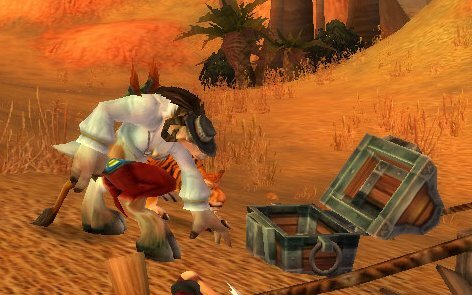 If you can’t find them, some decent substitutes might be Twill Pants, Brightcloth Pants, Gossamer Pants, or Guard’s Leggings (Horde quest reward). 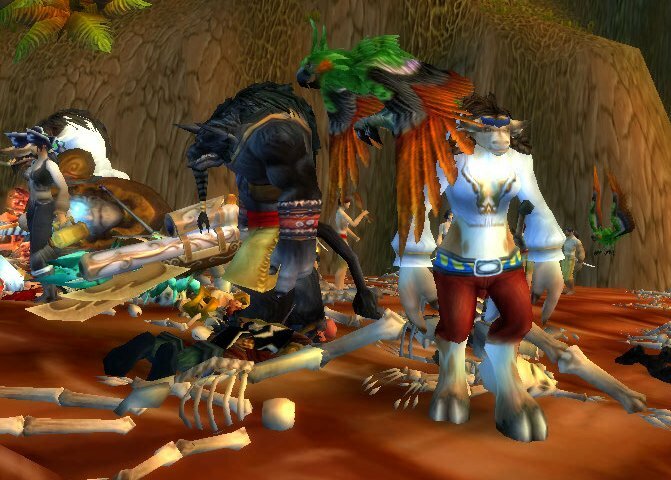 One of Demeza’s Dread Crew members pictured here with Kamalia in the Corsair Costume. This version of the Dread Crew outfit uses the Guard’s Leggings and a Small Dagger (since Ketura didn’t have a Cutlass on hand). The long captain’s coat worn by pirate NPCs such as Hecklebury Smotts (pictured), Baron Longshore, and Captain Grayson’s Ghost. 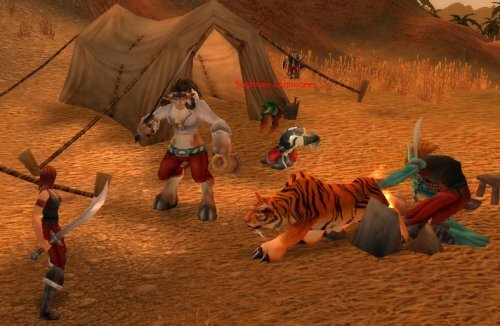 *SIGH* Please Blizzard, can we have this as an equippable chest armor item for players? Hope you enjoyed my outfits!